While they may be unfamiliar to some of us here in Georgia, the traffic junction known as a roundabout has roots dating back to the eighteenth and early nineteenth centuries. Today, they are becoming more common in Georgia and greater Atlanta, though not without some controversy. To get the straight story on the circular intersection, we asked driving instructor Dan Reilly for a hands-on lesson. 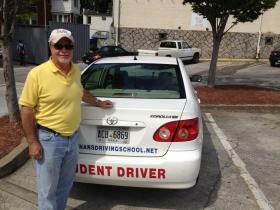 We met Dan at the roundabouts near the entrance of Emory University, buckled up in his “student driver” sedan, and I got behind the wheel for a real-time traffic tutorial. Click here for information about roundabouts from GDOT.